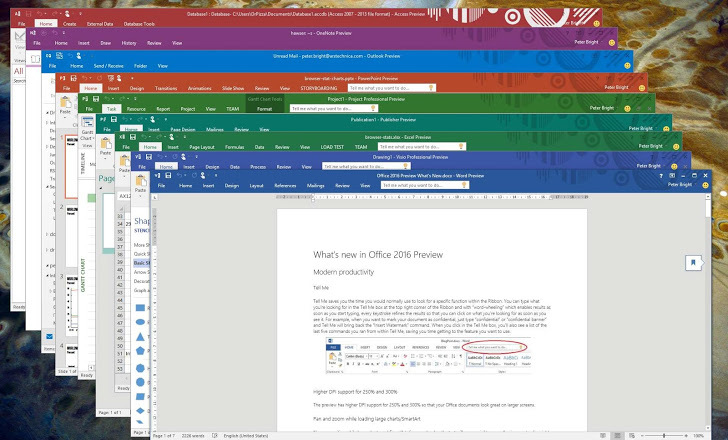 Earlier this year, Microsoft had announced to bring its Office 2016 soon to the world. Also, Office 2016 software version for Mac was released in July 2015. Now speculations gearing up are hinting towards a final release date of Office 2016 for Windows as 22nd September 2015. Though, for Window users it may not be quite a change, because in the new Office suite as compared to its predecessor Office 2013 no such major improvements are visible. Office 2016 for Windows is supposedly debuting in less than a month away and will be available for home and professional users initially. Office 2016 is going to be more colorful, with bright and dark colored theme options. Also, this time Microsoft has made it pretty clear that people are required to have Office 365 subscriptions because this time Microsoft is going to send new updates of Office along with the updates of Office 365. Mostly, modifications are done in the Outlook application of Office suite of Microsoft, with Word and Excel applications following. Microsoft's internal memo to employees acquired by WinFuture has revealed that the company will be launching Office 2016 on September 22. The Office 2016 preview is presently aimed at IT professionals and developers and requires an active Office 365 subscription.